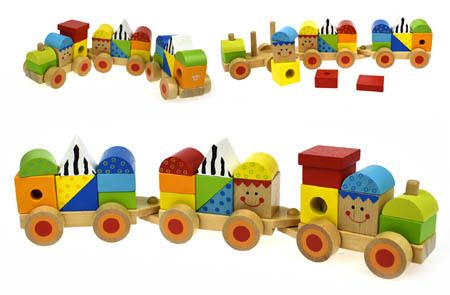 Wooden Block Train Push Toy is a bright, colourful engine, of a really good size, that comes with two carriages hauling 23 blocks of different sizes, colours and shapes. The blocks all come apart from the carriages and engine and can be stacked in different combinations making it a fun challenging toy that will keep your little one busy before they chug it off around the living room. This toy, like all the best toys, is multi purpose and teaches as your little one plays. You can take it apart , put it back together learn about colours and when you have done all that use it as a train. This Train is 39cm long... a perfect size! We like this because: "It is a multi purpose toy that is well made, a classic wooden toy train."